Oliver has had a passion for the music of Monteverdi and his contemporaries since his student days in the Hague. He has been a been a key figure at the heart of historical performance for 20 years, and can be heard in concert and on disc with many of the UK’s best known period instrument ensembles: he is the leader of Ludus Baroque (Edinburgh) and principal and guest leader with the Gabrieli Consort & Players, the London Handel Orchestra, the Early Opera Company and the Hanover Band. As a soloist he has performed on violin, viola d'amore and violino piccolo at major London and British venues, as well as festivals throughout Europe such as the Festival Paganiniano di Carro, Italy, and Vrijdag van Vredenburg in Utrecht. He is also frequently called upon as a leader and director abroad, with De Swaen (Amsterdam) and Barokkanerne (Oslo), and in 2012 he led the string band for Andrew Parrott's ground-breaking recording of Orfeo. Much in demand as a chamber musician, Oliver is a member of the Parley of Instruments, Passacaglia, Abbandonata and the London Handel Players, whose recent recordings for Somm have been described as “performances that are perfection itself, with a dazzling beauty of tone and of phrasing”. Almost uniquely among performers, Oliver makes his own gut strings; with luthier George Stoppani he has helped to re-string several baroque orchestras (including the Gabrielis) in the light of the most recent historical research. He is a professor at the Guildhall School of Music and Drama, and lectures throughout Europe on various aspects of historical performance. He is currently engaged in a project to re-create the Italian violin band of the 17th century in all its original glory: the Monteverdi Violins are the first part of this enterprise; other research interests include ornamentation from 1580 to 1850, and historical violin and bow holds. Bringing the fruits of scholarly research to life on the concert platform is a driving force behind his work. Oliver lives in London with his wife and 2 sons, although they spend as much time as possible in the mountains of Liguria. Theresa Caudle’s career started on the cornett as a teenager, when she became leader of The London Cornett and Sackbut Ensemble. She subsequently became increasingly active as a baroque violinist, playing with many of the leading period-instrument ensembles in this country, such as The English Concert, The English Baroque Soloists and The Brandenburg Consort. One of her main commitments has been to The Parley of Instruments, of which she was a principal member for twenty-five years and with which she made over fifty recordings. She directs her own ensemble, Canzona, as well as leading several other baroque orchestras on a freelance basis, and has coached at The Royal Academy of Music, Birmingham University and on several courses including Jackdaws, Benslow and The Oxford Baroque Week. Theresa’s solo CD, “Violino o Cornetto” was released on the Nimbus label in October 2010. Wendi Kelly was born in Edinburgh, and her love of music was fostered in a system where stringed instruments were allocated by school in order to ensure a good balance in the local youth orchestras: she went to a "viola" school. Since those formative days, she developed a love for the viola and its repertoire, studying at university in Edinburgh before going on to Trinity College of Music and the Royal Academy of Music. Her passion for baroque repertoire then took her on a scholarship to study with Lucy van Dael in Amsterdam, where she went on to work for the Amsterdam Baroque Opera Company and the Noordhollands Philharmonic Orchestra. Since returning to the UK she has pursued a rich and varied career on a selection of modern and historical instruments, performing, recording and broadcasting around Europe with many of the great pioneering early music ensembles, including the Hanover Band, the Gabrieli Consort, the New London Consort, the Taverner Players and the London Handel Orchestra, and still finding time to inspire future generations with her unique and dynamic brand of teaching. Wendi co-founded the MSB in 2003 with Oliver Webber; as well as a love for 17th century string music, she has a particular passion for Albinoni, and is the inspiration behind the band's Two of Spades programme. The enormous tenor viola in the Ashmolean Museum collection, designed to play the lower viola part in the early baroque string band, had long been regarded as just a historical curiosity until David, as one of the biggest viola players in the early music world, realised that if he didn’t try to play it then nobody else would! He always slightly dreads the prospect of going into battle with his George Stoppani copy of the original as it is indeed only just possible to to play it in normal “shoulder” position. Nevertheless he finds it very satisfying to add its special sound to the MSB and bring back to life the sonorities that composers would have expected. 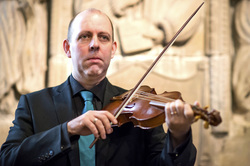 Aside from grappling with the special challenge of the Tenor, David has performed worldwide and recorded a wide range of music from Albinoni to Zelenka on more "normal" historically correct instruments, and is also active in music education with a special interest in orchestral training and “whole class” string teaching. Christopher, a versatile musician acclaimed for his captivating expressivity, specialises on bass violins of varying sizes, appearing regularly with the Monteverdi String Band, the English Cornett & Sackbut Ensemble and His Majestys Sagbutts & Cornetts. He is a principal player with the Gabrieli Consort and Players, and the Feinstein Ensemble, and has recorded with the Taverner Consort, the Early Opera Company, the Dunedin Consort and Ludus Baroque. As a continuo cellist he can be found guesting at at opera houses across Europe. Christopher is artistic director of the ‘fiendishly complicated … fast and faultless’ baroque ensemble, Abbandonata. He was previously College Musician at Queens’ College, Cambridge where he commissioned and directed new work for music, stage and dance; his innovative, peripatetic production of Monteverdi L’incoronazione di Poppea was met with critical acclaim. His work as a conductor, including Pergolesi with the Gabrieli Consort & Players and Hasse with Ensemble Serse, has been described as ‘scintillating’, ‘dynamic’ and ‘containing moments of real beauty’. Christopher is currently working towards a deeper understanding of his role in baroque opera by combining his performing career with doctoral research at the Guildhall School of Music and Drama and City University London. His practice-led research was most recently heard in a production of Handel Agrippina for Vlaamse Opera. In the coming year, the results of his research will be heard in recordings for the Gabrieli Consort & Players and Abbandonata, alongside the publication of a new cello method. Questions and, occasionally, answers raised by Christopher’s performance and research are, from time to time, detailed in the blog on this site. We are delighted to have the privilege to work with many fine guest artists. Regular visitors include Persephone Gibbs (violin), Joseph Crouch (bass violin), and Peter McCarthy (violone). We frequently collaborate with other ensembles when larger forces are required, and in recent years we have especially enjoyed working with the English Cornett and Sackbut Ensemble. Since 2012 we have very much enjoyed working with Passacaglia performing high baroque concertos at festivals around the UK.